Lancelot “Yank” Terry played his entire MLB career as a member of the Boston Red Sox. A right-handed hurler, Terry pitched in the big leagues for five seasons (1940, 1942-1945). He's listed as 6-feet-1 and weighing 180 pounds. Terry was born in Huron, Indiana, on February 11, 1911, to George and Edna (Kirk) Terry. George Terry was a schoolteacher (and briefly a former pitcher himself) who by the time of the 1920 census had become an insurance agent.1 He could well be the same pitcher named George Terry who pitched for parts of two seasons (1910 and 1911) in the Illinois-Missouri League, and for Vincennes in the Kitty League in 1913. In his American League player questionnaire, Yank said his father played professional baseball but he couldn’t remember the names of the clubs. Lancelot had two brothers, Armand (six years older) and Wayne (five years younger). Yank was a multitalented athlete, though he didn’t play baseball in high school. He was on the basketball team all four years, and his senior yearbook dubbed him “a veritable streak of lightning on the hardwood.” He was a member of the school chorus his first three years and he was on the track team for his final three years, noted for his pole-vaulting. Terry was recruited by George Keogan to play basketball at the University of Notre Dame.5 Keogan, who coached Notre Dame basketball for 20 seasons (1923-1942), never had a losing season with the Irish under his tutelage. He saw potential in Terry, who was the sixth man on Bedford’s high-school basketball team – the top-ranked team in Indiana – and an elite pole vaulter for the track and field squad. Keogan, however, did not believe in Terry’s baseball abilities. Terry tried out for the team, at shortstop, but Keogan cut him on the first day of practice in the Irish’s 1930 season. Terry dropped out of Notre Dame the following year and went on to play semipro basketball in South Indiana and Kentucky before shifting his focus to baseball, upon the advice of his father.6 He took up pitching. The following year Terry played for the Terre Haute Tots in the Class-B Illinois-Indiana-Iowa (Three-I) League. He threw a four-hit 1-0 shutout in the season opener, but came to have his share of struggles from the mound, coughing up 130 runs in a team-high 230 innings. Terry was, however, able to record a team-best 16 wins. He also managed a productive season as a hitter, batting .248 in 101 at-bats. In 1936 Terry signed with the Louisville Colonels of the Double-A American Association. His issues on the mound continued, and he didn’t win his first game until June 12. He posted a 5.63 ERA in 39 appearances (4-6, with six starts). Terry batted .268 (11-for-41) that season. After the season ended, Yank married Wilma Lucille Minger, on October 18, 1936, in New Albany, Indiana.8 Wilma, a worker at GM Powertrain in Bedford, survived him by nearly 25 years, living until March 28, 2004. Terry settled in and spent the next two seasons with the Colonels. He had another rough season in 1937, winning three and losing five with a 5.74 ERA in 94 innings and a 1.649 WHIP (walks and hits per inning pitched). At the plate, he had 7 hits in 27 at-bats. Terry took a step in the right direction the next season, lowering his ERA to 4.32. On September 3 he threw a seven-inning no-hitter against Columbus in the second game of a doubleheader; only one fourth-inning walk made it less than perfect. His 9-12 record (.428) was significantly better than that of his last-place team (53-100, .346). In 1939 the Colonels became an affiliate of the Red Sox. Terry started the season with Louisville, but was 1-3 and suffering a sore arm. On June 22 he was optioned to Scranton of the Class-A Eastern League, appearing in six contests before returning to Louisville. Back in Double-A with the Colonels, he recorded a 3.16 ERA in 17 games (10 starts). He put up a 3-4 record as the Colonels won the 1939 Little World Series over the Rochester Red Wings. Playing the majority of the 1940 season for the Colonels, the lanky right-hander registered a 3.70 ERA and a WHIP of 1.272 in 151 innings. On June 20 he struck out 15 Milwaukee batters in a game. On July 29 the Red Sox sent Charlie Wagner to Louisville and called up Terry, who was 7-9 at the time. Arthur Sampson of the Boston Herald wrote that Terry was no neophyte, but had been “pitching in the minors long enough to know what pitching is all about. He hasn’t a world of stuff, but he’s usually around the plate with his serves, and for that reason he may be of some service.”9 Essentially, the Sox had given up on Wagner and figured they’d give Terry a try. Terry made his major-league debut on August 3, 1940, for the Red Sox against the Detroit Tigers in the nightcap of a doubleheader at Briggs Stadium. Terry came out of the bullpen in Boston’s 14-2 lopsided defeat at the hands of the Tigers, who chased Red Sox starter Herb Hash before the second inning had ended. Terry struggled in mop-up duty, yielding four runs and six hits in 4⅓ innings. Terry made his next appearance against the New York Yankees in the first game of a doubleheader at Yankee Stadium on August 13. Again in a relief role, he pitched much better this time.The Red Sox trailed 6-1 by the time Terry entered the game in the third inning. Terry gave up a triple to Frank Crosetti, the first batter he faced, and threw a wild pitch that allowed Crosetti to score. Then he struck out the next three batters. Terry finished the game, allowing three hits, including RBI singles by Joe DiMaggio and Tommy Henrich. Four days later, Terry faced the Washington Senators at Fenway Park in his first big-league start. He was far from dominant, giving up eight runs in seven innings. The Red Sox provided him with plenty of run support, though, with home runs by Jimmie Foxx (catching that day), shortstop Joe Cronin, and center fielder Dom DiMaggio. Terry picked up the 12-9 victory, the lone decision of his rookie season. He appeared in one final game that season the first game of a doubleheader against the Tigers on August 24. The Red Sox were pounded, 12-1, with an infective Terry surrendering four runs in just two innings. Red Sox starter Joe Heving gave up seven runs in 2⅓ innings. Terry finished with an 8.84 ERA in 19⅓ innings in his rookie season. In September Terry and his wife welcomed a first-born, George. After a rough rookie campaign, Terry found himself back in the minors, optioned in February 1941 to the San Diego Padres of the Pacific Coast League. He had a banner season, getting his 20th victory on August 15, and finishing with a 26-8 record and a 2.31 ERA in 37 starts (315 innings pitched). He struck out 172 batters and led the league in strikeouts, wins, and ERA. Baseball writers named him the PCL’s Most Valuable Player for the 1941 season,10 giving him 55 out of a possible 64 points.11 Red Sox manager Joe Cronin went west after the season and asked what Terry had have that he didn’t have when he was with the Red Sox. He was told that Terry had developed a “pivot which hides the ball momentarily from the batter and makes timing by the batter more difficult.”12 Some writers commented that Terry only began to succeed when he turned his back on the hitters. Occasionally when he was trying to throw a batter off-stride, he would “take out his upper dental plate and make faces at the batters.”13 After the season Terry refereed basketball games in Indiana. Naturally, the Sox hoped he was now ready to make it as a regular starter with the 1942 team. A good summary of the way he progressed with the Padres was in Fred Knight's piece in a March issue of the Boston Traveler.14 He won his first start, a 5-1 complete-game three-hitter at Yankee Stadium. Then he dropped three in a row, watching his ERA nearly quintuple. After giving up five runs in one inning on June 15, he was removed from the rotation. He worked occasionally in relief, and got three other starts late in the season, but appeared in only 20 games in all. Terry won six games and lost five –the only season the righty managed a personal winning mark. His ERA was 3.92 ERA in 85 innings. 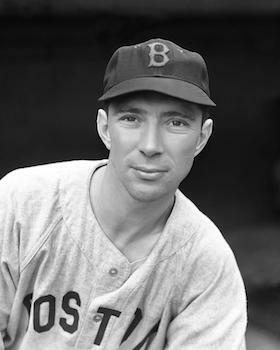 Despite a bout of measles at the end of March 1943, Terry pitched a career-best 163⅔ innings that year for the seventh-place Red Sox. He registered career highs in wins (7), ERA (3.52), appearances (30), starts (22), complete games (7), and strikeouts (63). Terry had a draft physical in Indianapolis in March 1944 and was rejected for military service because of what was described as “heart trouble.”15 He was 33 years old. All the breaks seemed to go against him in the first couple of months of the season; he lost his first six decisions (in three of them, Boston was shut out) and he didn’t get a victory until June 30, despite an ERA of 3.52. The Red Sox moved up from seventh place to fourth, but Terry’s record went in reverse: In 132⅔ innings, with 17 starts, he was 6-10 with a 4.21 ERA. The Red Sox fought for the pennant right into August, when they lost some key players to military service. The 1945 season was Terry’s last in the major leagues. He was 0-4 in 12 appearances (four starts) and 56⅔ innings pitched with a 4.13 ERA. On August 2, he was optioned to Louisville. In seven late-season appearances, he was 4-2 (3.29). In the Little World Series he pitched a five-hit victory over against the Newark Bears as the Colonels won the series in the six games. The 1946 Red Sox were loaded with returning veterans, and the 35-year-old Terry was cut. He signed with the Los Angeles Angels, then the Triple-A affiliate of the Chicago Cubs. He recorded a 12-15 mark with a 2.86 ERA in 192 innings. After the season Los Angeles sold his contract to Tulsa of the Texas League, but Terry retired from Organized Baseball. With the Red Sox (1940, 1942-45) Terry logged a 20-28 record with a 4.09 ERA in 457⅓ innings. In his minor league career (1934-1941, 1945-46), Terry won 85 games and lost 77. After baseball, Terry moved back to his hometown of Bedford and worked at a number of jobs. The Bedford City Directory shows him as a salesman in 1950, an operator at Indiana Limestone in 1952, a salesman for a TV and appliance firm in 1955, and a salesman for Best Beers in 1960. For some years, he worked as a painting contractor. He founded and owned Yank’s Sportsman Store.16 He later worked at the Elks Club in Bedford. Terry played semipro ball in Bedford through at least 1951. Yank and Wilma had two sons, Ronald and James.17 Ronald, born on September 18, 1940, in Louisville, served in the US Army and worked for Wiley Publishing as a graphic designer.18 He died on June 15, 2011. James Terry was born on December 10, 1943, in Bedford. He also served in the Army, then earned CPA certification from Indiana University and worked as an accountant.19 Jim attended Red Sox games in his father’s pitching days and became a lifelong fan of the team. He died on November 12, 2014. How had Yank done against the New York Yankees? His career ERA of 3.03 was the best against any of the seven American League teams he faced. He threw 71⅓ innings against the Yankees, and was 2-2. He worked the first 8⅔ innings in an 11-inning 2-2 tie game on June 25, 1943 at Fenway Park. In addition to the sources noted in this biography, the authors also accessed Terry’s player file and player questionnaire from the National Baseball Hall of Fame, the Encyclopedia of Minor League Baseball, Retrosheet.org, Baseball-Reference.com, and the SABR Minor Leagues Database, accessed online at Baseball-Reference.com. Thanks to Pete Cava for very useful information. 1 Pete Cava offers the following from the Bedford Daily Democrat, April 23, 1908: "George Terry, of Huron, who was here last summer and pitched for Oolitic in a game or two at Washington park, is another Lawrence County boy who seems destined to make good as a ball player. He was here Tuesday, just having returned from Grand Rapids, Mich., where he made good in a try out as pitcher. He has been sold to the Jackson club of the South Michigan league and will play with that club this, his first season in professional ball." No Terry is found listed on the available records of the Jackson team. 2 Wilma Terry, quoted in Bill Swank, Echoes from Lane Field (Paducah, Kentucky: Turner Publishing, 1997), 48. 3 Boston Herald, July 31, 1940: 18, and August 17, 1940: 13. It wasn't only the Herald. The San Francisco Chronicle reported the same thing in 1941. See the May 24 paper. 5 Cappy Gagnon, Notre Dame Baseball Greats: From Anson to Yaz (Charleston, South Carolina: Arcadia Publishing. 2004), 98. 7 "Ken-Rads Beat Servel 1 to 0 in 14-Inning Marathon," Evansville Courier and Press, October 1, 1934: 10. 9 Arthur Sampson, "Yank Terry No Neophyte," Boston Herald, July 30, 1940: 14. 10 “Yank Terry Named Most Valuable,” Los Angeles Times, October 23, 1941. 11 "Yank Terry Gets Coast Loop Award," San Diego Union, October 23, 1941: 15. 12 Burt Whitman, "Cronin Admits Joe D. Best," Boston Herald, November 23, 1941: 66. 13 "Yank Terry Most Valuable in Coast League," The Sporting News, October 23, 1941: 6. 15 United Press, Marietta (Georgia) Journal, March 17, 1944: 5. 16 Peter Cava, Indiana-Born Major League Baseball Players: A Biographical Dictionary, 1871-2014 (Jefferson, North Carolina: McFarland, 2015), 199.